All purpose wall and ceiling finish for interior and exterior use on cement plaster, fibre cement, concrete, brickwork and various types of composition boarding Also suitable for application to metal and wooden surfaces, provided those surfaces are suitably primed before the application of this material. 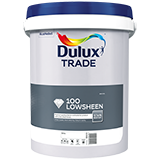 Dulux Trade 100 Lowsheen is a premium quality interior and exterior product with a low sheen finish that has outstanding stain resistance. Approx 10 m² per litre per coat.